Need to print it? Download the whole list. Click on the Mix ID number to view the species list for each mix. For more information about bulk seed options and characteristics, please review the Buy Seeds in Bulk page. Show your support for Florida's wildflowers! Get the wildflower tag. The $15 donation you make when purchasing the State Wildflower license plate sponsors native wildflower research, planting and education throughout Florida. Click here to purchase the State Wildflower license tag and find out more about it. See how Sunshine Mimosa covers a lot of ground. 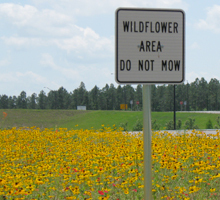 Learn how Golden Mane Tickseed can brighten your roadsides.